Modding, Sleeving, generally improving the appearance of the system: These hobbies find more and more followers! To truly complete a modding project it is a must to also replace the dull original plugs which are usually white or black . Mod/smart now offers a whole series of connectors to allow modifications even down to the very last details. 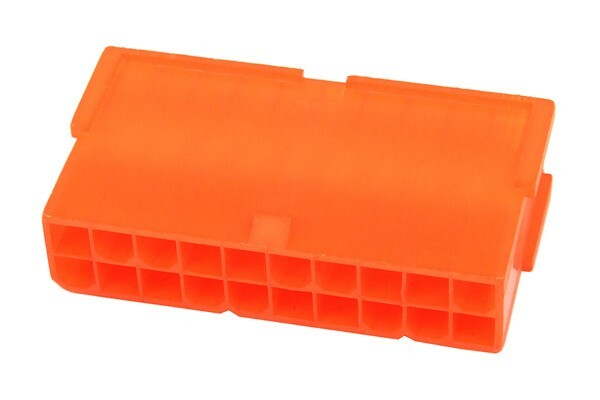 This connector is UV-reactive brite orange. With the use of this connector the inside of your case can truly be completed to be a masterpiece of modding. This connector type is usually used to connect the Mainboard or graphics cards of the system to the PSU. Please note: If you have no more metal pins for this plug we recommend Art.No 82235 for sockets and Art. No. 82236 for plugs.